Thermal Imaging Energy and Heat Loss Surveys London. We frequently conduct heat loss surveys for both domestic and commercial clients who find that their heating costs have soared or who have a particular concern with a room, office, extension or the whole property. The types of enquiries we receive vary from clients wishing to locate the source(s) of a draft, to establishing where their property is losing heat energy, to finding the causes of mould or fungus, damp walls, and bowing floors. 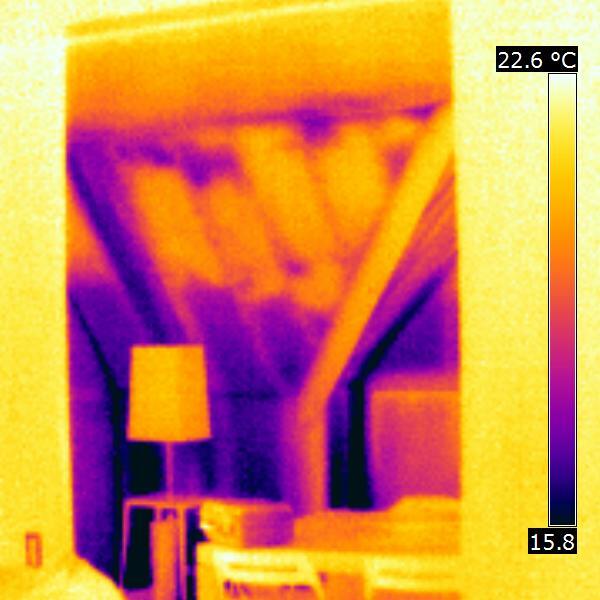 Our qualified thermal imaging specialists conduct surveys on homes or property, producing a report which clearly identifies individual areas where heat may be being lost or energy wasted. We find, more often than not, that the problems are not what the client had thought they would be. Missing, slipped, & discontinuous insulation. Defective seals in doors or windows. Locating electrical cables, pipes, joists & beams. Mapping faulty areas of underfloor heating. Call Building Response today and find out how we can help make your home more thermally efficient! 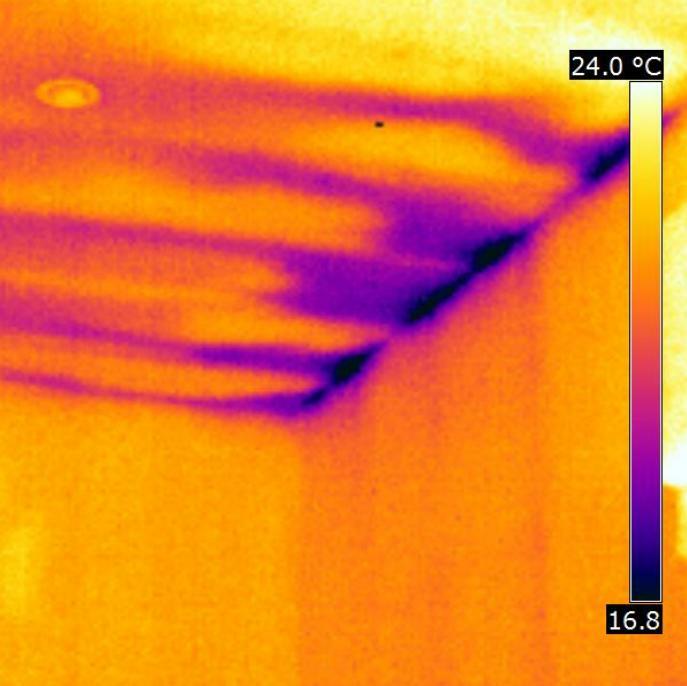 The thermal Image at the top of this page was taken during a Building Response Thermal Imaging Survey on a property in the South East of England. This Thermal Image, along with subsequent analytical findings by the head of our Thermal Imaging Diagnostics Department, James de Miguel, were presented in a professional report to the client, and subsequently the focus of a Daily Telegraph newspaper article. We use a range of additional test and inspection equipment including blower door fans, for creating negative pressure in buildings for the purpose of locating the source of drafts, borescopes and flexible camera units. Using a range of inspection methods allows us to provide accurate and detailed information and ensure that cost is minimised when conducting repairs or alterations. Air can be seen blowing in under the eves of this roof and moving the insulation away from the edge of the property allowing drafts to be felt within the room. What you can see here is cold air movement creeping in through the ceiling and, over time, pushing the roll-out fiberglass insulation further and further back, dramatically reducing the thermal efficiency of the building. Here, the insulation between the rafters is the wrong type of insulation and this property is suffering from drafts and high energy loss as a result. The insulation is not solid insulation and therefore it has fallen down inside the wall leaving large open areas where it is easy for energy to escape. Missing insulation in a ceiling can lead to damp and mould spots as a result of excessive energy loss through a single point and condensation forming upon these surfaces. The purple points on the walls show the plasterboard connection points with the walls. This is an example of just how sensitive our equipment is, and just how much we can tell you about your property. Here, the insulation between the rafters has been blown away from the wall by the airflow up under the eves into the roof. This means that air circles under the ceiling plasterboard and drafts blow through the room. This occurs on many properties which require roof ventilation and is a common explanation for drafts.